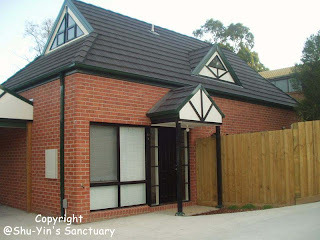 Shu-Yin's Sanctuary: I miss Melbourne! 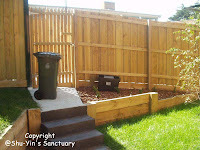 And also after seeing Yit Fung blogging about Melbourne, I miss it even more. Below is the hse Ndru, Ee Lyn, Adrian & I shared. My gawd...i look so young n stupid. Haha. And holding my 'sweet-smelling' rabbit pillow. We are a weird kind (actually, my housemates are weird...not me!). We icq-ed each other from our respective rooms. We use our free calls from our mobile to call each other to come down for dinner...we don't shout! Just thinking back about these things make me smile. 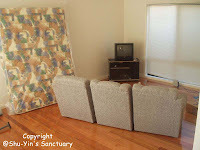 Our barely-furnished living room - utilized mostly by Adrian & EeLyn sitting in front of the tv watching tv series. Ndru & I are not fans of tv series. 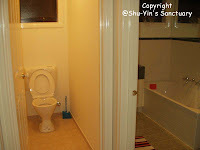 The bathroom & toilet that Adrian & I shared. 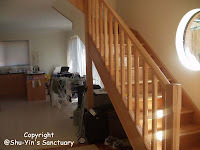 The staircase leading to our rooms upstairs. Ndru's room is downstairs though. 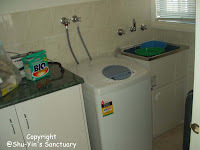 Our laundry area with our life-saving washing machine. Our backyard aka garden. The place where Adrian & Ndru took a puff at times. We only cut the grass when they were unbearably long and untidy. Actually I have many, many more pics about the places we went, the funny things we did, all the outings and gatherings, etc. yf...yalor. im also very glad i spent 10 mths in Aus, though I missed peter a lot that time! good one. so when is the next post. wasted i dun have pics. so when is the next post? still not ready? eh send me all photos pls.